Ulf Plessentin: Oct. 18, 2016, 4:59 p.m. There are lyric lines that looses their meaning if used too often. One of such line is from Hermann Hesse's poem Steps "A magic dwells in each beginning". It is used abundantly to kick-off events or the begin of study. This was not the case on the CERES introduction day for fresh undergraduate students who just enrolled into the study programme. 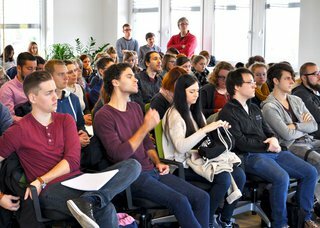 Presented by dean of students, Dr. Jens Schlamelcher, and course coordinator Hanna Steppat, the new students were trained crash-course like in what it actually means to study Religious Studies (Religionswissenschaft), what topics the subject is about and how the programme is structured. The introduction meeting was completed by a late breakfast offered by the student representatives. However, even if Hesse's line was not recited, the topic of magic will still accompany the students in their studies. Especially within the introduction to histories of different religions, it will be broached as issue in one way or another: Be it in as divination practices in Antiquity or in the literature on schmanistic magic rituals in Central Asia. Magic never fades away.